How often have you been asked to do something new but it looks really hard so you have put it off or tried to get out of doing it. I know I have. But as a UX designer this is not a good way to look at things. Everything I get asked to do is new and never the same as what I have done before! I do not think I could have made the switch to UX designer without this piece of advice from an old manager. 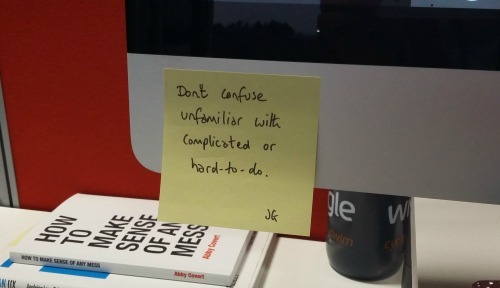 "Don’t confuse unfamiliar with complicated or hard-to-do"
And when I have got started it generally is not as hard as I feared. For example I have been working on designs for a project since Christmas. I finally had a full set of wireframes which everyone was pretty happy with, but now they wanted high fidelity mockups to show a stakeholder. I am no UI designer and so although the task was assigned to me I made it very clear that I was not sure how well the mockups would come out. I had created my wireframes in Adobe XD, so continued in this programme. And I surprised myself. It seems that I can copy really well and so although I was designing a new feature I had been deliberately reusing current functionality so I could copy how these things currently look just adding my new content. My mockups came out really well and although I would not want to have designed anything from scratch, just adding new functionality to a current page was easy. Every time I do something new I learn something and I build on my confidence. And this works right across my life, not just as a UX designer, but as a knitter/crocheter trying out new stitches, as a cook trying out a new recipe or a sewer learning how to make a pair of trousers. By changing my mindset anything is possible.